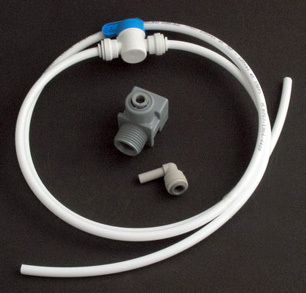 The recent rise in popularity of flexible hoses to connect sink faucets has made undersink water filter installation a lot easier. The convenient flexible connectors have replaced rigid copper tubing as the connectors of choice. For sinks that still have a solid copper pipe that takes water from the undersink shutoff valve up to the sink faucet, the old standby “saddle valve” is still the most frequently used inlet device. Saddle valves are convenient and relatively easy to install, but they have their long-term disadvantages. The saddle valve pierces the pipe with a small hole to allow water to flow to the water treatment device, so if you ever decide to remove the saddle valve, you’ll be left with a pipe with a hole in it and you’ll have to replace the pipe. If you uninstall the water filter, the best solution is to leave the saddle valve in place and cap it. Go here for more saddle valve installation and use information. Classic Saddle Valve. 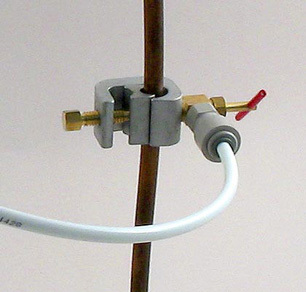 The valve is used on solid copper pipe only. After the valve body is clamped around the pipe and tightened, the red handle is screwed in, piercing the wall of the pipe. The handle is then screwed out, allowing water to leave the pipe and enter the white tube on its way to the water filter. This type valve should be installed only on the riser going up to the faucet–never on the copper pipe upstream of the shutoff valve. For installation on faucets with flexible risers (either stainless or plastic), water can be taken from the line by installing a special adapter into either the bottom connection, where the riser attaches to the shutoff valve, or to the top connection, where the riser connects to the stem of the sink faucet. Although there are exceptions, in most cases the bottom connection is a 3/8” compression fitting and the top connection is a 1/2” pipe thread. These easily inserted adapters are easily installed and easily removed if you uninstall the water filter. The “Max Adapter” for installation on the lower end of the flexible riser. To install, simply remove the 3/8″ compression nut, screw on the adapter, then screw the nut from the riser onto the top of the adapter. The fitting is easy to install, easy to remove. The blue handled valve is the on/off valve for the water filter. The inlet kit above is for installation on the top end of flexible risers. All Pure Water Products undersink filters and reverse osmosis units come with an inlet kit suitable for the customer’s installation. 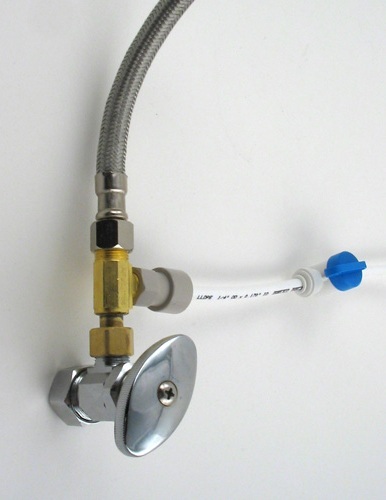 All kits include and inline valve (blue handle) that serves as the on/off valve for the water filter. Inlet kits are also sold separately.